A long time ago in the Philippines there lived a very wise and wonderful man. He lived among the animals and acted as a judge whenever the animals had an arguement or dispute. "Judge, Judge, complained the Bird. What am I to do? Each night the Frog makes so much noise that I cannot sleep. "Bring me the Frog," demanded the judge. "We will find out why he is disturbing you." Before long, the Frog was standing before the judge. "Frog," demanded the judge, "Why do you continue to disturb the bird's sleep at night?" "Your honor," said the Frog, respectfully I cry out every night to protect myself from the Turtle. The Turtle carries his house on his back. Whenever he comes near me, I am afraid that it might fall on me and hurt me." "I see," said the judge. "I understand why the Turtle cries out at night. "It is the Turtle's fault that the Frog cries all night and keeps the bird awake. Bring me the Turtle." It did not take long until the Turtle was brought before the judge. "Why do you make the Frog afraid by carrying your home on your back?" "Your honor," stated the Turtle. "I have to carry my house with me to protect it from the Firefly. The Firefly is always lighting his fire. I am always afraid that the flames will destroy my house." "I see," said the judge. "I understand why the Turtle is afraid of the Firefly. It is the Firefly who scares the Turtle who has to carry his house on his back which scares the Frog why cries out at night and keeps the bird awake. Bring me the Firefly!" Very shortly the Firefly was brought before the judge. "Why do you frighten the Turtle by playing with your fire?" the judge asked the Turtle. "Your honor," the Firefly answered politely. "I only light my fire to keep the Mosquito from poking his dagger-like mouth into my frail tender body. He keeps threatening me. "I understand why the Firefly carries his fire," said the judge. "It is the Mosquito that threatens the Firefly and causing him to light his fire which scares the Turtle whoi carries his house and frightens the Frog causing him to cry at night and keep the Bird awake. Bring me the Mosquito." So the Mosquito was ordered to appear before the judge in court. "Why do you frighten the Firefly with your dagger-like mouth?" the judge demanded of the Mosquito. But the Mosquito had no answer. He would not say why he had threatened the Firefly. 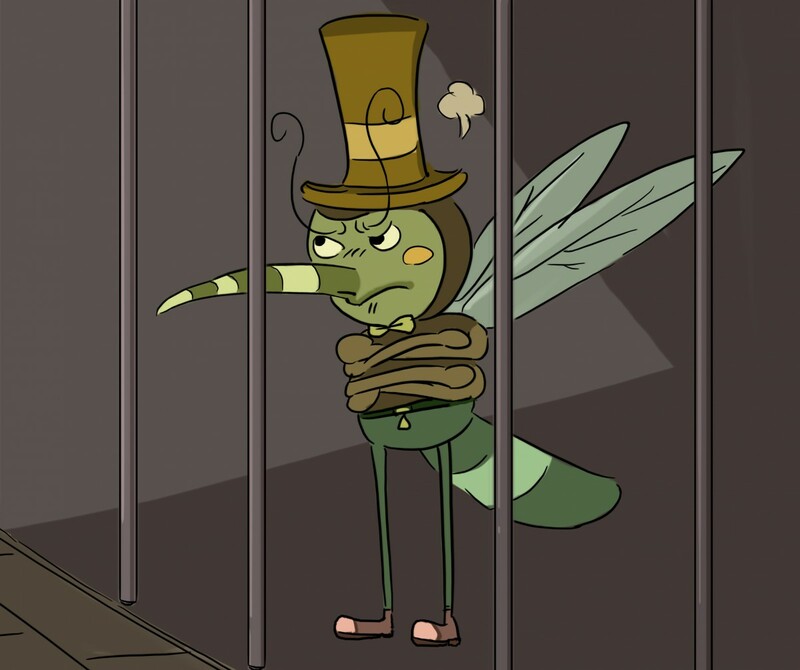 So the judge sentenced the Mosquito by sending him to prison for three days. During those three days, the Mosquito lost his voice. Never again could the male Mosquito sing and buzz as his sister mosquitoes do. And never again did the male Mosquito bite anyone or any animal. Note: Adapted from "The Animals Go on Trial" in Once in the First Times, 1949, stories retold by Elizabeth Hough Sechrist and attributed to Filopino Popular Tales, 1921, by Dean S. Fransler.